The Society’s History Group is continuing its study of the 1836 map that lives in Hadleigh Town Archive. The map is carefully hand-drawn and is accompanied by a listing of each dwelling with the name of its occupier. With the guidance of Joint Town Archivist, Sue Andrews, the group has been collecting additional information about the properties and the families who lived in them. The period of research was extended to include information from the 1841 Census. Also, at about that time a new Rector arrived in Hadleigh, who kept a diary detailing his daily activities, his workload and rich descriptions of his parishioners! Although the 1836 map only shows the main streets of Hadleigh, it was felt that the area of study should be extended to include all outlying farms within the parish. Having accumulated all this fascinating information, the group naturally would love to share some of it with you, and so will be giving a presentation to the Society sometime in 2007. In the 17th Century there were many killer diseases including smallpox, fever, measles and diarrhoea, but the most devastating of all was plague. There were five major outbreaks of plague throughout the century and Hadleigh was affected every time. Our speaker on October 5th, Clive Paine, explained to a fascinated audience how original documents can be used to assess the impact of plague on towns and villages in Suffolk. The average annual number of deaths in seventeenth century Hadleigh was about 50, but in 1637 an outbreak of plague caused the total to rise to 258. On one day alone, 10th May, seven plague victims were buried. However, the worst outbreak was in 1666 when Hadleigh’s parish register recorded a total of 344 plague deaths, which accounts for 68% of the total deaths for that year. The first death occurred in April and the last on 19th December. Five members of the Thorne family and six members of the Richardson family died within days of each other in April. The plague was at its peak in the warm summer month of June when 56 people, out of a monthly total of 64, died from the epidemic. Towns and villages all over Suffolk suffered; in 1604 Ixworth was infected and Long Melford lost 18% of its population to the plague in May 1604. In that year, an Act was passed by Parliament for ‘the charitable relief of persons affected by the plague’. Struggling communities could ask for help from other parishes within the Hundred. We heard about the remedies and cures that were available. People would try to protect themselves from the plague by hanging a little bag about the neck or using ‘celestial waters’! Very occasionally the plague did not prove to be fatal, as shown in the account of the experience of 16 year-old Leonard Gales who recovered from ‘the sickness’. There were no more outbreaks of plague in England after 1666, probably due to climate changes. By the end of the evening, Clive had provided a wealth of information and statistics to give us an amazing insight into how the entire community of Hadleigh would have been affected by each visit of the terrible plague. · and, of course, the all important restoration / conservation of historic buildings and the demolition and development of others (e.g. the Guildhall, Toppesfield Hall, the Silk Factory, the Corn Exchange and the Co-op). Ron [Rocky] Bennett started this scrapbook in 1983 on behalf of the Hadleigh Society, Paul Garrod then took over in 1988 when Ron became unwell and Tricia Bloomfield continued the good work from 1995 until August 2005 when a new loose-leaf scrapbook became the responsibility of Margaret Woods. Isn’t it good to know that the numerous newspaper reports relating specifically to our town & providing an extremely vivid and lively picture of its life and people will be available for our children, grandchildren and great grandchildren (and perhaps even beyond) to read in their own Hadleigh town archive? Roy Smith informed us in the January Community News that work will begin on building the Tesco supermarket in the summer, Babergh Officers and members tell us that Tesco will be building on the riverside site; meanwhile the Society has said nothing. Why? The situation as we see it is as follows. The Inspector at the District Plan Inquiry agreed with Babergh that the riverside site is suitable for a supermarket and could therefore be identified as such in the new District Plan due for confirmation in July. The Inspector is following the Governments guidelines in PPS 6 which briefly lays out a sequential test for supermarket sites, i.e. first one must look at potential town centre sites, (remember all of the fuss a few years ago when Magdalen Road car park was mentioned as a possible site). The car park site was deemed unsuitable for a supermarket, therefore the next step in the ‘sequential test’ is to look for edge of centre sites, thus the Brett Works / Riverside site being the next option if it is ‘suitable’. Now that the Brett Works / Riverside site is being included in the District Plan Tesco’s planning application will need to be placed before the Babergh Committee for determination. As you will remember Tesco submitted a plan in December 2004. That submission identified a ‘bog standard’ glass building and two possible entrances onto Bridge Street. There was no detailed information about the entrances and nothing at all about how the traffic in Bridge Street will be handled. At the District Plan Inquiry we obtained copies of letters from the Environment Agency identifying that they ‘Objected’ to the development, subject to a number of details concerned with alleviating the risk to the flood plain. We do not yet know if their objection has been removed. To achieve an access to the site Tesco have to acquire part of Babergh staff car park and part of Hadleigh Town Council’s allotments. Babergh are willing to sell their car park and have asked Hadleigh Town Council to join them in negotiating a price with Tesco for both pieces of land. Babergh have suggested to the town council that if they negotiate together the money might go towards a Swimming Pool!! To-date Hadleigh Town Council has been opposed to the building of a supermarket on that site and opposed to selling their land. Babergh however can Compulsory Purchase the town lands and sell them to Tesco. At the January Town Council meeting the Council decided not to enter into discussion with Babergh and Tesco at this stage, the Council decided to wait until they have seen the details of Tesco’s plans and then decide if they continue to object or are prepared to sell their land. Babergh are suggesting that to get the best price we should enter into discussion now. The Hadleigh Society has acquired a number of booklets from the Deputy Prime Ministers Office and has distributed them to all of the properties likely to be affected by the development and who may well have claims for compensation for the devaluation of their property, and to Town Councillors. (If any member wishes to borrow a set please contact me). Why has the Hadleigh Society not taken any obvious action to date? Simply until there is a planning application out for public discussion we believe there is no action to be taken. As soon as the plans are in the public arena then we will start to campaign and will need all of the support we can manage to oppose the application. If Babergh, Tesco’s or their supporters group think that we have given up they are due to be sadly disillusioned. If you want to catch up on the national concern about the increasing influence of supermarkets in general and Tesco in particular then look at these websites (you might find it easier to do this from our online version of the Newsletter). Having cut his teeth on a successful chronicle of Holland-on-Sea, Roger Kennell turned his attention to Hadleigh, his home for most of his adult life. Over the years he has built a collection of postcards and books and has drawn on these to illustrate the changes in the town through the 20th century. At the start of that century Hadleigh was an agricultural centre, largely self-sufficient, with a population of 3200, a market on Mondays next to the Corn Exchange and Town Hall. Several churches (although not yet the Catholic Church). Passengers could arrive by train; Wilson's the corn millers was the largest employer and there were also mat and rope factories and maltings. The Urban District Council ran the place and there was a Court as well as a Police Station. The Fire Engine was horse-drawn. The population dipped in the 1930s, the airfield came and went again, and passenger trains ceased. The Second World War revived the railway activity, supplying the REME workshop and ammunition dump. By 1950 the population was back to the level of 1900 but in the 1960s, probably for the first time since mediaeval era, the growth really started and the industrial estate was established, although we lost a few services such as the cinema. At the 23rd November meeting Roger treated us to a few of the photographs that didn't make it to the book. One remains a mystery, a 1902 photo titled 'Keeble's Pond'. Others showed features now disappeared: the open stream that flowed down Angel Street and High Street, Cook's Emporium that dwarfed Barclay's Bank, the Deanery before its wings were clipped, the White Lion's vine, Toppesfield Mill and the Egg Packing Station. For £6.99 you can own this fascinating collection of pictures and support one of the finest features of our town. Over the centuries Hadleigh has ensured that the fabric of the church has been maintained for successive generations. In his modest way, Roger is contributing to that tradition: all profits are going to that cause. You can find it in any of the bookshops in the town, including Avis, the publishers. is a registered charity recording the UK's complete collection of oil paintings in public ownership and has recently published its Suffolk catalogue. For £20 in soft cover or £35 hard cover you get reproductions of 1800 paintings from 39 collections. See their website at www.thepcf.org.uk or call 020 7747 5936.
is holding its annual meeting at Mendlesham on the 18th March. Call 01473 242500 for information. 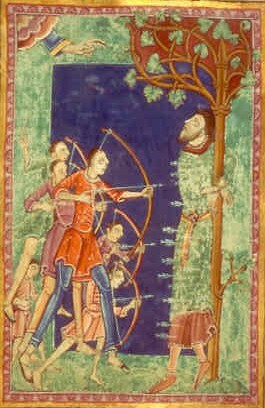 Dr Sam Newton returns on Monday 3rd April to talk on St Edmund: History and Legend. Sue Angland has succeeded in getting a grant for the Hadleigh Society to purchase a digital projector, for use in conjunction with a laptop computer. We expect to use it to help illustrate many of the Society’s presentations but it will also be available for loan to other local organisations for similar purposes. If you think this might be useful to you then please contact our Honorary Secretary.